In order to describe the complex details of hormonal receptors and how they generate biological responses, it is appropriate to present a brief review of cellular organization. 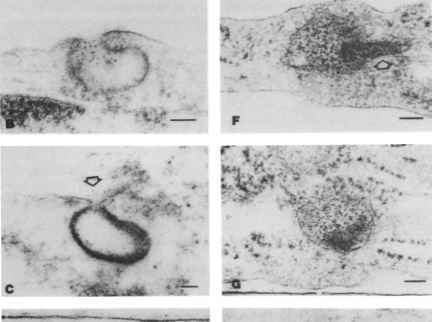 A typical animal cell is shown in Figure 1-14. FIGURE 1-18 Three-dimensional ribbon representation of the nuclear pore complex. For clarity, the dimensions of certain features have been altered; for example, the inner spoke ring (ISR) is disproportionately short and thin. Abbreviations: CR, cytoplasmic ring; NR, nucleoplasms ring; LR, lumenal ring; S, spokes; LS, lumenal spoke domain; RA, radial arm dimers; T, transporter, CP, cytoplasmic particles; CF, cytoplasmic filaments; NC, nucleoplasm^ cage; DR, distal ring; NEL, nuclear envelope lattice; ONM, outer nuclear membrane; INM, inner nuclear membrane; L, nuclear lamina; R^ lamin receptor. Modified with permission from Akey, C. W., and Radermarcher, M. (1993). Architecture of the Xenopus nuclear pore complex revealed by three-dimension cryo-electron microscopy. /. Ceil. Biol. 122, 1-19. Although the precise content of substances that comprise the cell membrane differs in different cell types, many components are common to all membranes. These are lipids (including phospholipids and glycolipids), proteins, and glycoproteins. The cell membrane that encloses the cell resembles the internal membranes, such as those associated with the nucleus, mitochondria, and microsomes. The approximate lipid compositions of different cell membranes are presented in Table 1-3. The lipids consist of two portions: a head group and a tail. 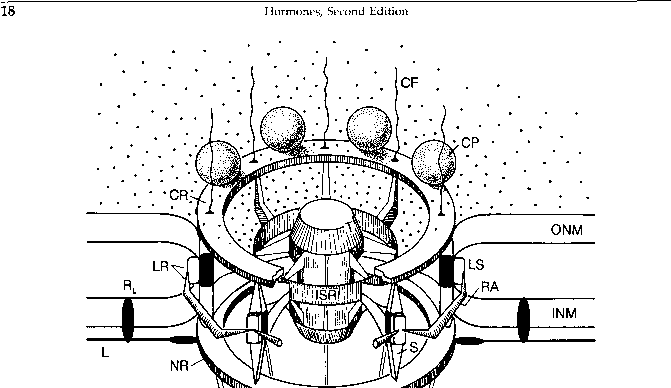 The head groups are charged (hydrophilic), while the tails are uncharged (hydrophobic). They form bilayers spontaneously oriented, so that the heads are on the water side and the tails are internal. This resembles the basic structure of the cell membrane and provides for a negative charge on the head side of the membrane. This arrangement is pictured in Figure 115. Included in the membrane are various proteins, some of which are receptors, ions and other small molecule transporters, and enzymes. The specific proteins vary from cell type to cell type depending on the special membrane functions required by a given cell. Some of the proteinaceous constituents span the membrane so as to make contact with both the extracellular space and the cytoplasm, while others do not but can translocate to either side. 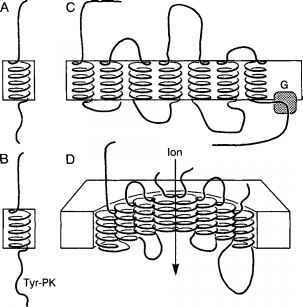 Proteins that span the membrane are called intrinsic or integral proteins. Extrinsic proteins are those associated with the periphery of the membrane but that may not be associated directly with the phospholipid layer. The cell membrane interacts with the fibrillar and tubular structures in the cytoplasm, facilitating dynamic movements of portions of the membrane into the cell (e.g., during internalization of ligand-receptor complexes). Thus, membrane components may connect with proteins called spectrin, actin, and others, partly visualized in Figure 1-15. In the context of the model just described, it is believed that various conditions, such as changes in the metabolism of phospholipids and responses to various signals via receptor interactions, can lead to changes in fluidity of the membrane that allow proteins to move within the membrane. This movement can generate productive interactions that can result in the stimulation of enzymatic activities on the cytoplasmic side of the cell membrane or other events. A model showing this type of motion is presented in Figure 1-16. In eukaryotes, the nucleus and cytoplasm are separated compartmentally, except during interphase. The nucleus is surrounded by a nuclear envelope, which comprises two membranes separated by a small space. Also present in this nuclear membrane are pores (see the next section). Inside the nucleus are the nucleolus and the chromatin. 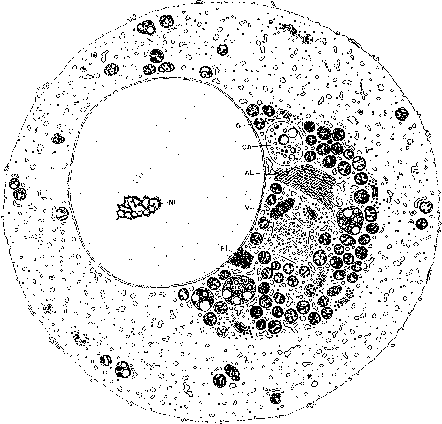 The nucleolus is where the DNA that encodes ribo-somal RNA is continuously transcribed. The chromatin comprises DNA and tightly associated basic proteins (histones) that represent the chromosomes; the individual chromosomes are only visible during the time of cell division. The DNA and histones interact to create nucleosomes. Figure 1-17 presents a schematic model of the organization of a chromosome which includes in, ascending hierarchical order, DNA + histones, nucleosomes, chromatin fiber, and chromatid. Communication between the nuclear and cytoplasmic compartments is important for a wide variety of cellular activities. These can include the transfer of enzymes synthesized in the ribosomes that are essential in the nucleus for DNA replication, repair, and transcription. In addition, mRNA precursors and associated proteins move out of the nucleus. Also, some steroid receptors move from the cytoplasm to the nucleus via the nuclear pores. Evidence has been presented for the existence of specialized communication pathways, termed the nuclear pore complex (NPC). The NPC is responsible for mediating molecular trafficking between the nuclear and cytoplasmic compartments. The NPC is an oc-tagonally symmetrical cylinder of «80 nm length X «=100 nm diameter; its molecular weight has been estimated by scanning electron microscopy to be «1.25 X 108. The NPC comprises a family of proteins known as nucleoporins. Figure 1-18 presents a schematic model of a nuclear pore complex. FIGURE 1-20 Stages in the endocytosis of LDL ferritin and its subsequent appearance in the lysosome. Fibroblasts were incubated with 47.5 ¿u.g/ml LDL ferritin for 2 hr at 4°C, washed, and warmed at 37°C for various times (bar = 1000 A): (A) typical coated pit; (B) transformation of coated pit into endocytotic vesicle; (C) formation of a coated vesicle (arrow indicates that some of the LDL ferritin is left on the surface of the cell as the plasma membrane begins to fuse to form the vesicle); (D) fully formed vesicle (arrow shows the loss of cytoplasmic coat on one side); (E) endocytotic vesicle that has completely lost the cytoplasmic coat; (F) irregularly shaped endocytotic vesicle (arrow shows the region of increased electron density with lumen); (G) similar to (F) with more electron-dense material in the lumen; (H) secondary lysosome containing LDL ferritin. Reproduced with permission from Anderson, R. G. W., Brown, M. S., and Goldstein, J. L. (1977). Role of the coated endocytotic vesicle in the uptake of receptor-bound low-density lipoprotein in human fibroblasts. Cell 10, 351-364. Copyright © 1977 by MIT, Cambridge, MA. 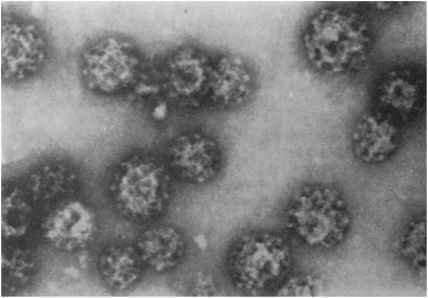 FIGURE 1-21 Electron micrograph of isolated coated vesicles from adrenal medulla magnified 125,000 times. Reproduced from Pearse, B. M. F., and Bretscher, M. S. (1981). Membrane recycling by coated vesicles. Annu. Rev. Biochem. 50, 85-101. Copyright © 1981 Annual Reviews Inc., Palo Alto, CA. tor-peptide hormone complex is formed, there are two possible resulting scenarios: (a) the ligand-receptor complex may be internalized into the cell or (b) the ligand-receptor complex may generate its signal transduction event(s) on the inside of the cell while maintaining its position in the cell membrane. These alternatives are discussed in the following sections. The internalization of the ligand-receptor complex may function to allow the release of the intact hormone or derived peptide fragments on the inside of the cell. Among the possibilities are the following: a means to degrade the ligand after it has promoted some action (or not) at the cell membrane; a means to degrade the receptor; a means to degrade the ligand to a product that is active in the cell's interior or to liberate an unaltered ligand inside the cell to bind to interior receptors (e.g., on the nuclear membrane) to produce a mitogenic effect; a means to degrade the receptor to an active fragment that would operate within the cell; and finally, and perhaps most importantly, it may be the off-signal for activity at the cell membrane level. Hormones have immediate effects at the cell membrane and in some cases have long-term effects through processes generated at the membrane or after internalization. FIGURE 1-22 Four classes of membrane-spanning hormone receptors: (A) receptor with a single-membrane-spanning component and without a tyrosine kinase component; (B) receptor with a single-membrane-spanning component involving a tyrosine kinase component inside the cell; (C) receptor with seven-membrane-spanning a-helical regions that are coupled to a separate G protein facing the interior of the cell; (D) receptor with part of a membrane-spanning ion channel. FIGURE 1-23 Example of hormone single-membrane-spanning receptors (B) and illustration of the structural homology of some of them to immunoglobulins (IgG) (A). The disulfide, S-S, bonds are indicated. 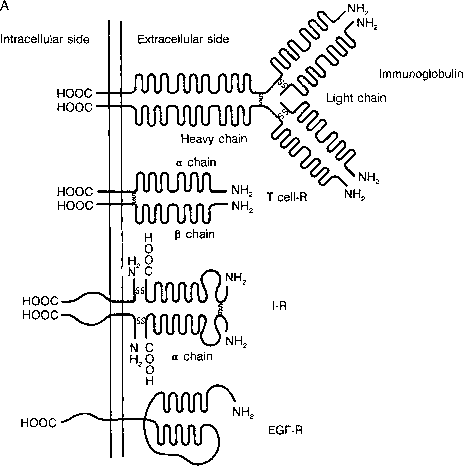 (A) Structural comparison between membrane receptors and immunoglobulin. In this very schematic drawing, the overall structures of two hormone receptors (EGF-R and I-R), the T-cell receptor, and an immunoglobulin are compared. Only S-S bonds between different chains have been highlighted. Repeated loops represent cysteine-rich regions. (Hood, L., Kronenberg, M., and Hunkapiller, T. (1985). T cell antigen receptors and the immunoglobulin supergene family. Cell 40, 225-220.) (B) Single-membrane-spanning receptors. The extracellular portion of these receptors contains the hormone-binding site. Tyrosine protein kinase domains are shown as open boxes, with insertions in the case of PDGF-R and CSF-I-R. Dots represent cysteines, and cross-hatched boxes represent the cysteine-rich domains. All N-terminal extremities are extracellular. All proteins are drawn to the same scale. In terms of a polypeptide hormone that produces a mitogenic effect on a cell, one possibility is to view the internalization process as a means to generate a mitogenically active fragment or phosphorylated form of the hormone or its undegraded structure inside the cell, so that it can interact in some way (receptor) with the nucleus to increase the rate of DNA replication. Perhaps some of these intracellular products can lead to activators of DNA polymerase a, the replicative enzyme. Internalization has been shown to apply to insulin-receptor complexes, EGF-receptor complexes, nerve growth factor (NGF) and thyroid stimulating hormone, and others. This process is referred to as "adsorptive" endocytosis. 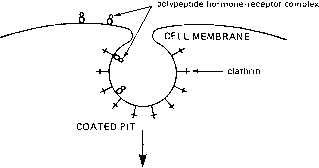 Polypeptides bind to receptors in coated pits that are indented sites on the plasma membrane. The coated pit invaginates into the cytoplasm, forming a coated vesicle containing hormone-receptor complexes. The vesicles then shed their coats and fuse with each other, and either then the receptors are returned to the cell surface after subsequent fusion with the Golgi apparatus or they fuse with lysosomes and the contents may be degraded. Formation of a coated vesicle is shown in Figure 1-19.